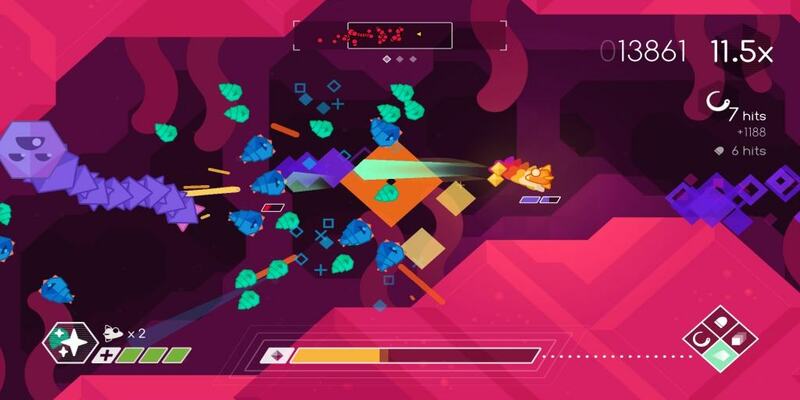 Graceful Explosion Machine: An Accessible Arcade Dream | Nerd Much? Graceful Explosion Machine may be the name of the ship you’re piloting but it also perfectly encapsulates what this game is all about. Explosion machine denotes the action of the game: a side-scrolling shoot ‘em up (shmup) in which players navigate a looping area, or confined space (depending), and use a variety of weapons to defeat the alien onslaught in each level. And with four weapons at your disposal, approximately a dozen enemy types, and over 30 levels spread across four planets, this game has plenty to offer in the way of explosions. Shoot ‘em ups are nothing if not explosion machines. 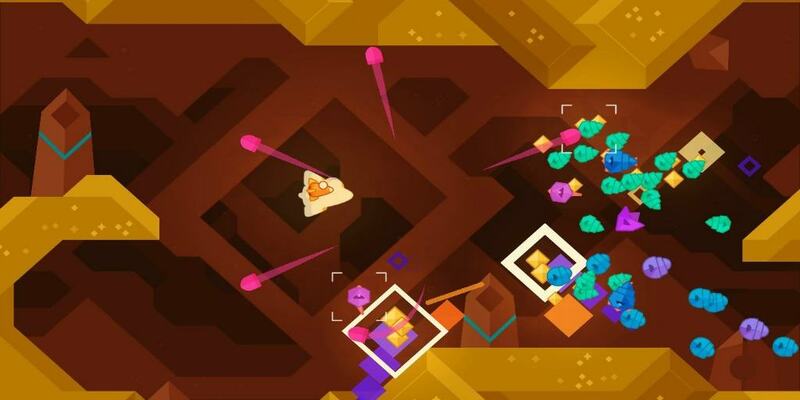 But it’s the element of grace that makes Graceful Explosion Machine (GEM) stand out amongst the crowd. Consider the word itself. Graceful, adj. “Characterized by elegance or beauty of form… elegant.” “Displaying *grace in form or action: Pleasing or attractive in line, proportion, or movement” (*a charming or attractive trait or characteristic). Now let’s examine how the developer, Vertex Pop, manages to pull off grace amongst the chaos shmups promise. This game is cute and establishes that immediately. The story is extremely minimalistic, opening with a short series of still images that the player must click through; as if you were reading a storybook. We’re introduced to an adorable little ship that has a pilot’s window so large that it looks like an eyeball. 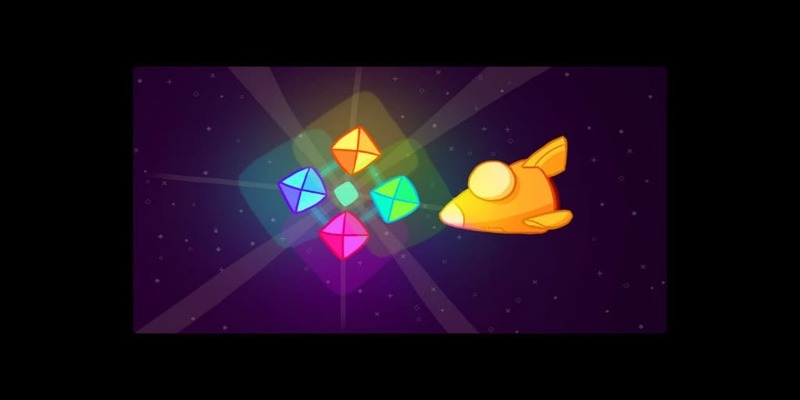 According to Vertex Pop, the “The GEM fighter is the most advanced single-pilot fighter in the galaxy.” But the design of the ship, and complete lack of written/spoken text, positions the GEM as a character in itself. Although it may be unintentional, this perceived personification works. We identify as a cute candy corn ship, rather than the faceless pilot inside it. Including a Blaster, an Energy Sword, a Sniper Beam, and Missiles. Each weapon does a different amount of damage and requires a different amount of energy. Mastering Graceful Explosion Machine’s gameplay means learning how to best utilize these different weapons in any given situation. Almost every level is a very simple stage that loops and, minus spawning enemies, it’s empty. There are a few exceptions to this. A few levels are small enclosed spaces (that do not loop). 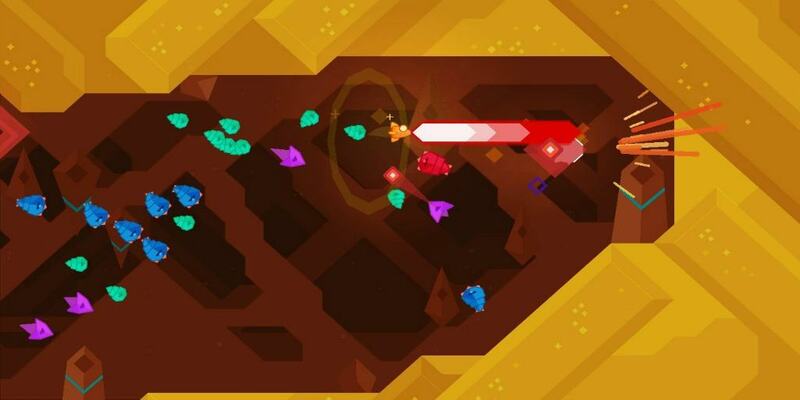 Additionally, a few levels introduce additional challenges, such as moving laser beams. But for the most part, the levels aren’t incredibly distinctive. Fortunately, Graceful Explosion Machine side-steps monotony by slowly introducing new enemy types. Plus the fun comes from dealing with the different hoards of enemies, the level design itself is very much backdrop to these fights. Obviously, it plays a role in that it can create extra challenges; this game wouldn’t be hard if players were given completely wide open space. But like the hit arcade games of the past (think Pac-Man anTetrisis), the joy of Graceful Explosion Machine is rooted in enemy behavior. The premise remains exactly the same but each time you play GEM it will be different. Graceful Explosion Machine makes me reach a trance like the level of focus (while trying not to overthink); it’s something I consider a hallmark of arcade games. GEM is a straight forward joy. Once you get comfortable with the weapons–which doesn’t take long at all–you’ll feel like a pro even if your end of level “grade” says otherwise. Graceful Explosion Machine’s gameplay has a fluidity to it that’s chaotically beautiful to watch. So much is going on at any given time, yet it seems to be happening with such ease. Everything happens quickly in GEM but your reaction times fall right into place with that speed—like magic. You’re facing an onslaught of aliens and use your energy sword to block bullets as you button mash the blaster button, weaving through the crowd with what can only be described as grace. Not into Shoot ‘Em Ups? Still give this a try. 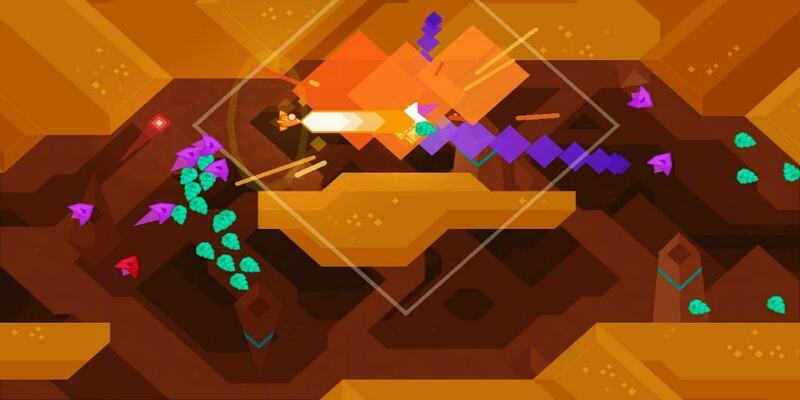 Graceful Explosion Machine does an excellent job at easing players in. Each weapon is introduced one at a time until and enemy types are highlighted bit by bit. I always knew what was going on in GEM because it was designed to be accessible, even to shmup noobs like myself. I usually avoid shmups because a lot of the ones I’ve encountered have been heavy on enemy fire and pattern based. I never felt like I stood a chance, so there was no real point in playing; my pattern recognition skills just aren’t up to par enough to survive for long. If you’re in that same boat you’ll be happy to hear that Graceful Explosion Machine offers something else entirely. In GEM Enemy spawning is random (no set patterns! yay!) and the enemy fire is scarce. A few enemies can fire bullets or shoot a laser beam but even those that do aren’t creating any bullet hells for the player. Trust me thought, the challenge is still there because there’s strength in numbers and wow, do these aliens have numbers. Any collision with an enemy or bullet will damage your ship and it doesn’t take many hits to destroy you completely. And for especially skilled players, you can always take on challenge modes and try to top your score. Luckily, GEM has some generous checkpoints. Almost every level consists of 3 phases of enemies and each phase acts as a checkpoint. The game also saves after each level so even if you’re burning through a lot of lives, progress is possible. In this way, Graceful Explosion Machine strikes the perfect balance between grueling levels and keeping players content/hopeful. Even when you’re stuck on a level (Planet 3 Level 2 was the one I struggled with the most) GEM makes you believe you can do it—just maybe after a break. An added bonus, depending on your viewpoint, is how short the game is. It took me over 5+ hours to beat it, according to my Nintendo Switch. So if you’re hooked on knocking out games but are constantly pressed for time. This one’s definitely for you. Lastly, I was surprised to discover that Graceful Explosion Machine is a great self-care game. You just jump into your candy corn space ship and shoot some bad guys. Also, all the bad guys are adorable. They’re geometric shapes with little eyes. And the gameplay will put you in an engaged trance. And with a $10 price tag, there’s no reason not to pick it up. The Hellboy Reboot Release Date NOT Set…Yet.